(Courthouse News) Despite repeated assurances California has enough water to fight the currently 18 major fires raging throughout the state, the Trump administration said Wednesday it will tell its agencies to suspend environmental rules to provide firefighters with water. U.S. Commerce Secretary Wilbur Ross issued a directive to the National Marine Fisheries Service to make water available to firefighters battling blazes up and down the Golden State. “As Secretary of Commerce, today I directed the National Marine Fisheries Service to facilitate access to the water needed to fight the ongoing wildfires affecting the State of California,” Ross said in a statement issued on Wednesday. The problem is Cal Fire says it has plenty of water and that extreme temperatures and high winds are the root cause of the difficulties they face in quelling huge fires throughout the state. “I can reassure you we have water,” said Cal Fire spokesman Scott McLean on Monday. Ross’ directive comes on the heels of President Donald Trump tweeting that “bad environmental laws” are responsible for the wildfire problem, particularly those mandating river flows be kept at certain levels for the health of fish populations, like the critically endangered salmon. But those regulations add more to the woes of farmers in the Central Valley and not to firefighting efforts, as pointed out by several experts. For one thing, firefighters have access to water if they need it. However, dumping water on a wildfire isn’t the primary way to extinguish it. Instead, firefighters build containment lines around the conflagration and wait for it to burn itself out. And so far no experts have come forward to link California’s water policy and the spate of wildfires afflicting the state the last two years. Interior Secretary Ryan Zinke did pen an op-ed for USA Today on Wednesday saying active forest management is the key to reducing forest fires across the American West. Notably, he did not mention alterations to California’s water policy as a viable solution. Critics see the Ross’ directive as yet another maneuver by the Trump administration to circumvent fish protections in order to deliver more water to farmers harmed by extensive drought. Gleick pointed to one part of Ross’ statement as proof positive that the Trump administration is more interested in getting water to farmers at the expense of river health. “Going forward, the department and NOAA are committed to finding new solutions to address threatened and endangered species in the context of the challenging water management situation in California,” Ross said. As of Wednesday, 18 major fires are burning uncontrolled across the state. The Mendocino Complex, consisting of two blazes burning near each other, is now the largest wildfire in California history at over 300,000 acres. Containment is currently 47 percent. The Ferguson Fire and the Carr Fire have scorched around 100,000 acres each and neither are over 50 percent containment. The Holy Fire in Cleveland National Forest in Orange County has blackened about 5,000 acres, but there is little containment and evacuation orders are on the rise. Authorities have arrested Forrest Gordon Clark, 51, on several felony counts of arson in connection with the fire. 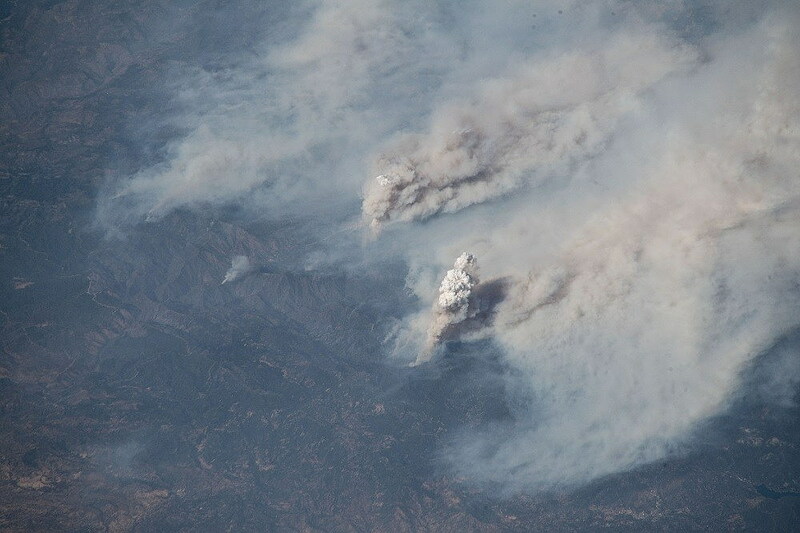 In all, the 18 fires have charred about 600,000 acres. Meanwhile in Sacramento, lawmakers returning from the summer recess had the recent flurry of wildfires on their minds. State Senate President pro tem Toni Atkins and Assembly Speaker Anthony Rendon agreed during a one-hour discussion with reporters Wednesday that wildfire-related legislation – namely Gov. Jerry Brown’s proposed overhaul of civil liability in utility-caused wildfires – is a top priority. Rendon said the Legislature isn’t prepared to let Pacific Gas & Electric or other utilities off easy when their equipment sparks deadly fires. “I’ve been very clear, we’re not going to bail out PG&E or anybody else; this is about moving forward and this is about the future of fires and fire management,” Rendon, a Democrat representing southeast Los Angeles County, said. Brown introduced the proposal while lawmakers were away on break, claiming reforms are necessary to shield utilities and the electrical grid from California’s now-unending fire season. He’s pushing sweeping reforms to laws which hold public and private utilities responsible for property damage when their equipment sparks a wildfire – even if the utilities aren’t to blame. The measure, which won’t help PG&E with the cost of the 2017 wildfires, would tweak the state’s strict liability framework and give judges more sway in determining how much utility companies should compensate fire victims. Atkins, D-San Diego, said lawmakers need to seriously consider the governor’s proposal. She thinks it will be the “toughest topic” left on the Legislature’s to-do list in 2018. “We are not here to bail out any industry, but we do have to take a hard look at it,” Atkins continued. The Democratic leaders said they will also take a closer look at California’s flimsy emergency alert framework. Wildfires have killed dozens of residents and firefighters since last October, leaving critics wondering why California doesn’t have a uniform statewide system for notifying residents about wildfires and other disasters. California’s 58 counties have their own systems in place that can send messages to landlines, but users must sign up for cellphone or email alerts. Senate Bill 833 is before the Assembly Appropriations Committee and would create a statewide emergency alert framework. The system would send out alerts to cellphones and landlines, radio and television stations, and billboards. Cities and counties would operate their systems and be required to undergo annual training.